Abigail Cline knows what it means to save a person’s life. She does it everyday as a firefighter and paramedic for Springfield Township Fire in Ohio. She also knows what it feels like to be on the other end, requiring lifesaving measures. At 15 years old, she was diagnosed with Hodgkin lymphoma, a cancer of the lymph tissue. As a teenager, stuffed animals were not necessarily the first gift requested, but Chemo Duck was different. Abigail said her mom found an article in a magazine about Chemo Duck and decided to get her one. She is glad her mom did. “I carried my duck everywhere,” laughed Abigail. “He was like my pillow on long drives to the hospital. He was my comfort during treatments in clinic and while I was in the hospital. As part of the yearlong treatment regime, patients routinely undergo radiation. But when doctors explained that the radiation therapy would affect her ability to have children as well as potentially increase the risk she would develop breast cancer, Abigail refused it. Her fear of the radiation was also the rationale behind naming her duck Radar, short for radiation. “I could not even go past the radiation area in the hospital without freaking out,” she recalled. “I thought naming him Radar would help me. While she was undergoing cancer treatments, her aunt was also fighting the disease, which allowed Abigail to explain to her younger cousins what their mom was experiencing. Today Radar resides on Abigail’s nightstand. 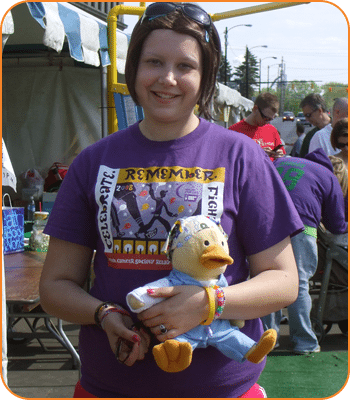 Over the summer she brought him along to the Relay for Life, a 24-hour long fundraiser for the American Cancer Society. Her squad donned full gear (air tanks included) and walked until the tanks ran out. Radar was tucked safely in Abigail’s pant pocket as she completed multiple laps.